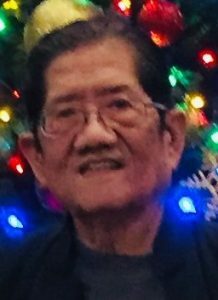 Patrick Siu Keung Cheng, 80, of League City, passed away Friday, November 30, 2018, in Pasadena. Patrick was born December 10, 1937, in Shanghai, China, to Yokshing Cheng and Anne Sun. Patrick is survived by his wife of 59 years, Philomena; his daughter Patricia Cheng Lynch and husband Wayne Lynch of League City; his son, Patrick Oscar Cheng, Jr. and wife Mary Knight Cheng of League City; his sister, Mary Cheng of Hong Kong, China; and his brother, Jackey Cheng and wife Xixiang Cheng and nieces Cyndi, Mandy & Jody Cheng of Katy; nephews Chris Jones of Los Angeles, California and Alex Jones of El Cerrito, California. Patrick is preceded in death by his parents; his two sisters, Siu Yee Cheng; and Alice Cheng Jones and husband Ronald Jones. Patrick grew up in Hong Kong. From there, he attended National Taiwan University in Taipei and Chung Chi College in Hong Kong before immigrating to the United States in 1958 where he attended UCLA and ultimately obtaining his Bachelor of Science in Finance from Houston Baptist University. While growing up and attending universities in Taipei and Hong Kong, Patrick was an accomplished concert pianist. After arriving to Los Angeles, Patrick worked as a waiter to save money so that Philomena could join him. Patrick and Philomena married January 31, 1959 in Las Vegas, Nevada and would have celebrated their 60th anniversary this coming January. Patrick was a lifelong restaurateur. Patrick started his career and quickly became general manager with Trader Vic’s at Beverly Hills in the early 1960’s. Patrick excelled to vice president of Dallas’s Trader Vic’s by 1966 and a year later opened Houston’s famous Shamrock Hilton Hotel’s Trader Vic’s. Patrick opened his own first of three Passage East Chinese restaurants in Houston in 1970 before settling down in Galveston in 1976 with the China Restaurant and later renamed Beijing Garden when he remodeled, adding a lovely garden and koi fish pond with many of the items coming from Taiwan. Patrick was a charter member of the Rotary Club of Galveston Island. Patrick and Philomena became United States citizens in the early 1980’s. After about forty years in the restaurant business, Patrick and Philomena retired in League City to be near their children. The family plans a celebration of life on Saturday, December 15, 2018 at 12:30 pm at Las Haciendas Mexican Bar & Grill located at 12933 Gulf Frwy in Houston, TX.